A most unusual shaped French copper casserole dating from the early 19th century. This piece is well made, from a substantial gauge of copper, and it has a castellated seam around the bottom, about 3cm. up from the base, and also up the one side. 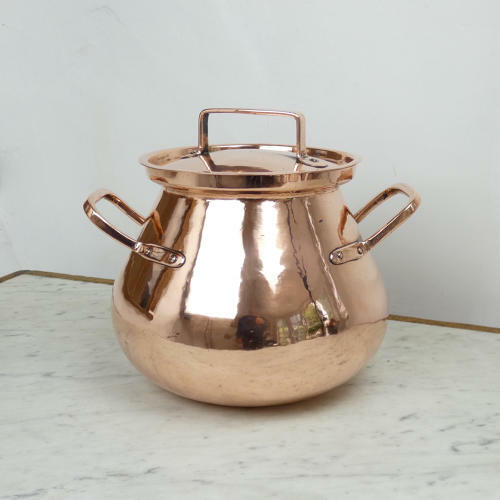 It is a very interesting, pot bellied shape and the copper handles are quite primitive in style. It dates from c.1830 and would most probably have been used on an open fire as the base is concave, so it would not have worked efficiently on a range. It is in excellent condition. The tinning, to the interior, has not been re-done recently but it is still in good enough condition for it to be used. Price includes postage within the U.K. Shipping to the U.S.A. add £35. Western Europe add £10.